You all are really great. Thank you for the anniversary wishes! Jeremy and I enjoyed a fantastic dinner at a favorite resto in Boulder – Jax Seafood. We always manage to overlap with happy hour because we have to get home at a reasonable time to feed Kaweah. Believe it or not, the dog gets acid reflux if she goes without food for a length of time. Perfect affliction for a lab, no? It was sunny and 40°F on my deck yesterday – a positively gorgeous day in the mountains. Spring is a wicked little girl. She taunts you with the sunshine and the longer daylight hours and that pervasive happy mood that sends people outside for sidewalk dining in short sleeve shirts. I happily wander toward the temptations of Spring like everybody else, but I also look back with longing and wonder if Winter is gonna diss me and withhold any further snow. Not a great ski season. Okay, I’m over it. Anything else is icing on the cake at this point. And really, I can’t complain because Spring is like the super social season when folks are ready to mingle but they haven’t left for their summer travels or vacations. One lunch gets canceled, another takes its place. 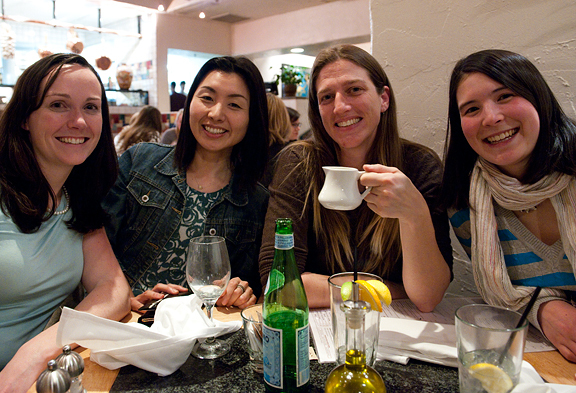 There is always laughter, but yesterday we added sushi and hauntingly bad 80s pop classics to the mix. Right on! It was blindingly sunny and lovely outside and I think the temperatures were in the upper 40s or even low 50s? It’s hard for me to gauge because I felt like it was 90 degrees and that my skin was burning off my limbs. Ah spring! I have a little potted plant in our great room that toggles between life and death on a regular basis. My grandmother gave it to me via my aunt (this is how Chinese people send things to one another, they never mail anything directly). This isn’t just a houseplant though, it’s a Chinese chive also known as garlic chive. Grandma can grow these on her balcony because… she lives in CALIFORNIA. I keep mine potted and indoors because I like to take snips of it for garnish at times throughout the year. Otherwise I’d only see it for three months of the year. Okay, maybe four. I don’t grow enough to cook with, so I have to make that special trek to Denver to get some. Many of my favorite vegetables are Chinese (Asian) vegetables. That might well be because I don’t eat them often enough for them to feel more commonplace. I suppose if I planted that little Chinese chive in the ground outside, it would spread and I’d be able to harvest enough in the summer to make a couple of stir-fries with it. Considering all of the pooping that goes on in our yard (not just Kaweah, but it seems every dog in the neighborhood) I don’t really want to go there. Oh, sorry… It’s a food blog, not a poop blog. These chives have a distinctly garlicky odor and flavor to them. They are wonderful. In most Chinese stir-fries you flavor your oil with some combination of garlic, ginger, and green onions, but not so with this dish. 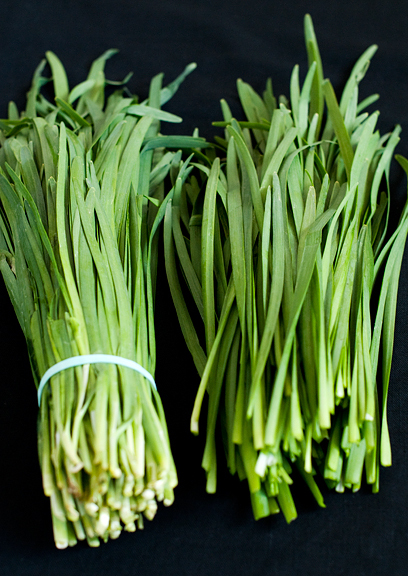 The Chinese chives carry the ensemble with their fragrant garlic flavor without overpowering the other ingredients. My mom would whip these chives up with some sprouts (mung bean sprouts, the kind you find in regular grocery stores) when I was little. I really think that is the key to loving your vegetables – growing up with someone who knows how to cook them well. I doubt most non-Asian grocers carry this vegetable. I have scoured the White Grocery Landscape for years with no luck. Your best bet is probably to venture to your friendly (and shouty) Asian grocer and check the fresh produce aisle. I am telling you: it’s worth it. Chinese Grandma says so. 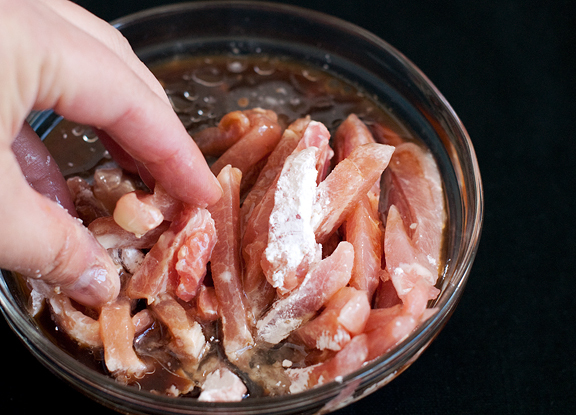 Mix the pork, soy sauce, Shoaxing wine, and cornstarch together in a small bowl until the pork is evenly coated. Set aside. Heat 1 tablespoon of vegetable oil in a sauté pan on high flame. 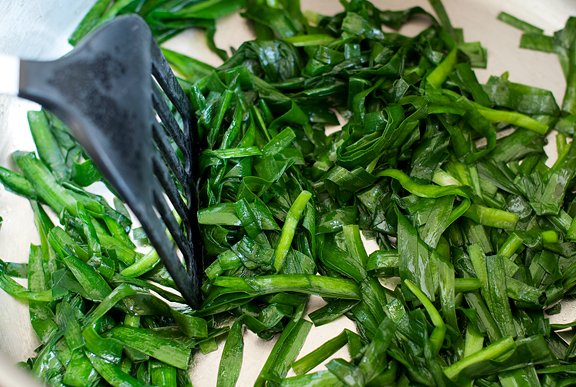 When the oil is hot, add the Chinese chives and sauté until they wilt and turn a dark green color. Remove from pan to a bowl. Heat the remaining two tablespoons of oil in the same pan. When the oil is hot, add the pork and stir-fry until almost cooked. 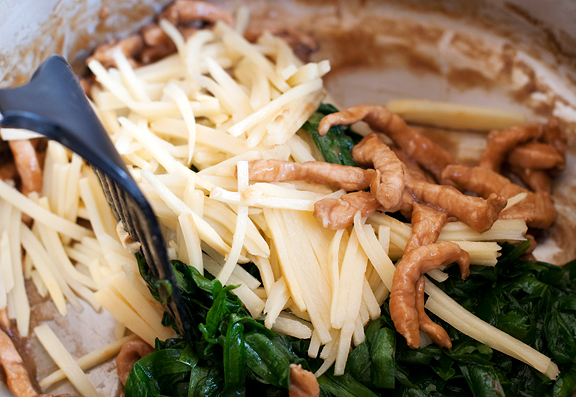 Add the chives and the bamboo shoots to the pan and stir-fry for a few minutes. Serve hot. this looks amazingly good. I must get my hands on some of those chives, and the shaoxing wine ! What a nice dinner out! Those sliders look insanely good. Mmmm Chinese chives – beautiful dish showcasing them. I can’t wait to give it a try! You mean it’s not just my Asian grocer that’s shouty?! What an odd world this is, and it totally makes me smile that your grocer is shouty too. I’ve got a trip to ours planned for this week – they’ve got the best prices on GF rice, tapioca and potato flours, and now I know that I’ll be looking for these chives too. Thanks for the tip! 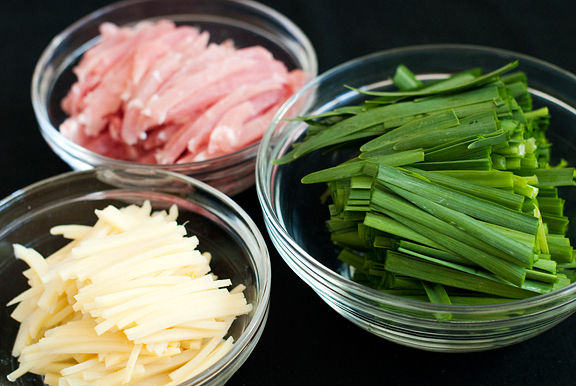 I have all those ingredients (except the chives, of course) in my house Right Now! Do you think I could use garlic shoots (the soft green bits that come up early in spring)? If not, I’ll go visit my “shouty” Korean grocery and see if he’s got them (the larger asian market does not shout, but I like Mr. Shouty – he’s fun.). Spring! This morning when I left for school it was full-on light outside. Yay! Can’t wait to see what you do with spring veggies this year. I am in love with that picture of the bundles of chives. Gorgeous! A gorgeous meal and fantastic stir-fry! Sad to have missed lunch yesterday! Looks like you had a great time at the sushi place, though! I’d never heard of Chinese chives…may try to grow them this summer! This stir-fry looks scrumptious, I love the last picture! I’ve never heard of Chinese chives, but I saw just yesterday something called “garlic chives” which looked exactly the same as these Chinese chives. I wonder if it would taste same. I live in Sydney and we get Chinese Chives at just about every asian grocer. Surprisingly, western herbs and spices are uberly expensive. So even though it’s just gone spring here, I’ve planted some parsley, chives(western), basil and dill. I love this dish, my friend has made this for me and it is AWESOME. Do you actually have a reall high body temperature or something, or do you just hate Spring because it means no more skiing? Oh that looks wonderful! When you post a Chinese recipe, I get so happy! We’re lucky… we have our choice of Asian grocers around here, although the closest one has a really sketchy-looking veggie section (their plants toggle between life and death on a regular basis, too). Will make the trip to H-Mart to get garlic chives for this dish! 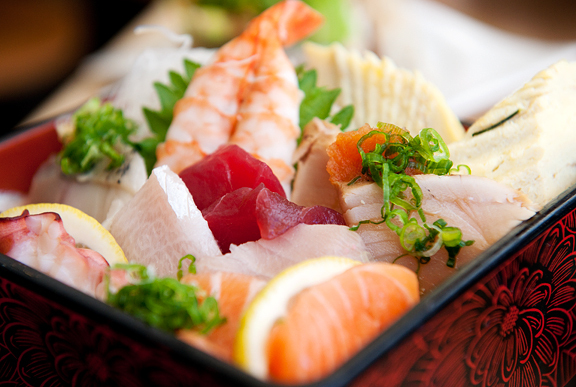 What a beautiful, beautiful dish. I’m glad you two had a great anniversary and that you were able to enjoy the spring weather with your friends. 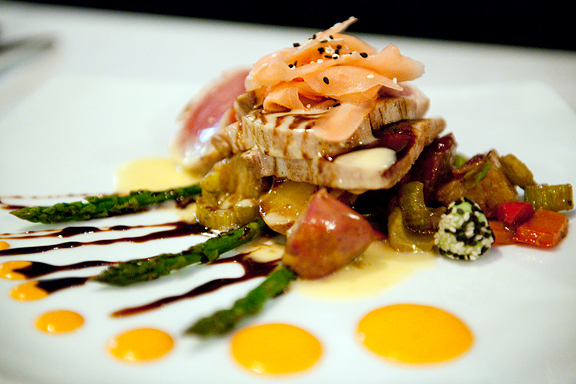 This dish looks delicious and healthful. Where can one buy Shaoxing cooking wine? did you make that blue bowl? it looks like one of yours! 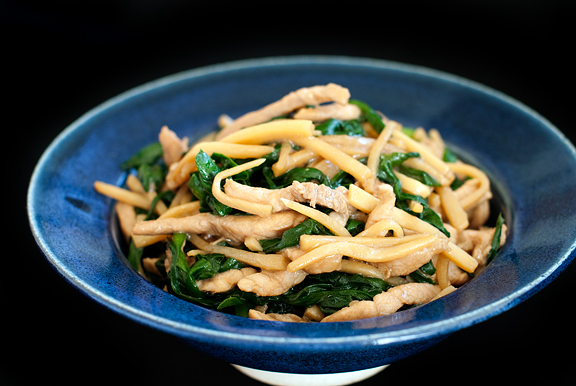 The bamboo shoots go limp after cooking and look like strands of noodles! My father-in-law gave me some of these chives a few years ago to plant in my garden and it has done extremely well. I haven’t used it much for my cooking, though, as I wasn’t sure how to use it. Now I have something to cook once spring rolls around! Thanks! 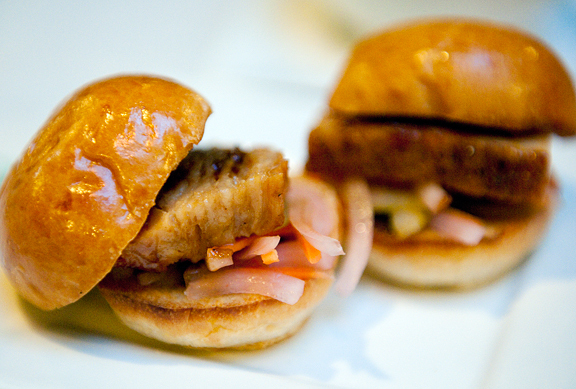 Wow, pork belly sliders – the ultimate guilty pleasure! The food looks so fresh and delicious. Chives are my favourite herb, especially garlic ones, yum! I love these chives especially those pan-fried dumplings you get at dim sum – absolute Chive Heaven. This dish looks sooooo gooood. Next time I am in Victoria I’ll stop by one of the Chinese grocers and pick up the Chinese Chives. This will definitely be on the menu soon. Thank you. don’t worry: spring corn is on its way even if you get skunked for another storm! i’m sorry to report that it’s been dumping here in mammoth all day…well, not sorry for ME, of course, but sorry it’s not nuking on you too! jealous of your chives, girl. I think I might have a hard time finding Chinese Chives here in Stockholm but I shall give it a try because that stir-fry looks so yummy! Is the flavour similar to garlic chives? I’ve seen that over here, but never Chinese Chives. They look similar though… The finished dish looks very tasty! I think they are indeed Garlic Chives (having different — but WAY too similar — names for everything is such a pain! — Taxonomist). I think we have those here, yay! A little serendipitous considering I was bummed when I thought they were garlic scapes on the shelves but turns out they were not. I’ll be sure to snag them, it’s pretty much all I need to buy to make this dish! Obedient non-Chinese grandson! I live in Florida and we have garlic chives growing out our ears here! I literally have to kill it back or it would take over our whole garden. Here’s my problem… and this might just be a white american problem but… (I’m nervous to say)… anytime I try to use them they are SO STRONG. Frankly, the scent of them raw makes me too scared to cook with them or bring them into my house. Is the key to use the fresh green tops? Does cooking them tone them down a bit? Maybe I’ve always tried to use them more a chive/scallion garnish and I should consider cooking them? It’s so weird that I have trouble with these! I love onions! I love garlic! Could mine be a more potent variety? I need encouragement to cook with these. I love seeing them grow in huge pots, their flowers are beautiful… I’m just nervous I’ll ruin a whole dish worth of effort if I add them. Ok, nervous rant over. I’m going to try these again, Thank You!! To answer Jessi’s question. Yes, it has strong garlic smell. However, it sure is good to eat them. Cook them outdoor is one solution. Then, try to find light yellow color Chinese chives in late spring, which has lighter smell, but do prepare to pay much higher price for that (I mean it is 4-5 times higher, b/c the growers have to cover the plants prior to their maturity). Use the same recipe to cook them as this one. It is delicious. I only buy them once or twice a year. mmmm-can’t wait to try Jax-we’re moving to Boulder (well, Louisville) in about a month from PENNSYLVANIA! We are so excited to live in Colorado. I have to ask? 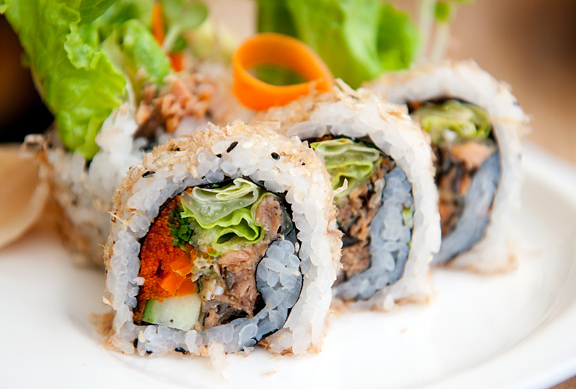 Where was the sushi restaurant-another must try when we get there soon! Don’t tell my mom, but this looks better than what she makes. Fiona – Hmmm, I don’t know. I have never had garlic shoots before! You’ll have to let me know if that worked out. TKW – you can definitely grow them down on the flats. I’ll bet they go gang busters. Sarka – I think they are the same thing. Karyn – oh, Kaweah is a very sad pup when she gets acid reflux. She basically has dry heaves and then throws up bile. Because it is such an uncomfortable feeling, she becomes desperate to put something in her stomach to make it feel better. When we haven’t been home, she has eaten house plants and potting soil – then threw those up someplace… We try to avoid it as much as possible. Stella – most Asian grocers should carry it. Even some western grocers have it in their Asian sections! 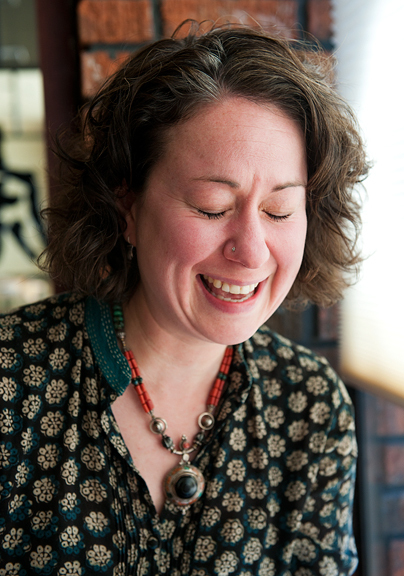 Ursula – that bowl is actually a gift from my pottery instructor :) But thank you – that’s quite the compliment! Sherry – I haven’t had them, but I have heard they are GOOD! Marisa – yes! They are the same as garlic chives. Jessi – they mellow out quite a bit when you cook them. Try stir-frying a small batch to see what you think. The images are making me want to eat right now. I love Asian foods because I rarely get to eat them. It looks really delicious. Those pork sliders look amazing…especially with the glazed buns. In New York you can often find the ones with mantao for buns, but these look a lot more decadent…and better.